Today we’re excited to announce the release of WPForms 1.4.1 and the new Offline Forms Addon! Have you ever tried to fill out a form online, only to realize you’ve wasted your time due to lost internet connection? That is frustrating enough to make most users never return to fill out the form again. To solve this problem, we’ve created our new Offline Forms addon which makes it easy for your users to save their data even when they’re offline. 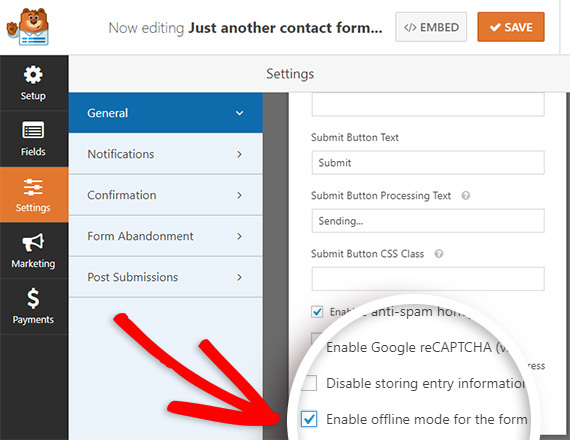 Now you can easily enable offline form submission with just a click. If anyone loses their internet connection while filling out your form, that’s no problem – everything they entered will be saved in their browser. When their connection is restored, they can retrieve their answers with just one click. Offline data collection such as checklists, auditing, and inspections in places where there is no internet connection. Offline surveys so you can easily collect responses in the field without internet. Events where Wi-Fi can be spotty. Now there’s no need to worry about missing out on leads and sales (especially when combined with our Form Abandonment addon). What’s New in WPForms 1.4.1? WPForms 1.4.1 includes a ton of improvements to make your experience building forms that much easier. We made a lot of under-the-hood code changes to build a better foundation for our future growth. Aside from that we also made several noticeable changes in this release. One big change is that we’ve completely translated the WPForms core plugin into Russian (Thanks to our new team member Slava). Translation and localization is going to be a big focus of ours going forward, so keep an eye out for new announcements along these lines. And if you have any suggestions for us, feel free to get in touch — we’d love to hear your ideas. There are also a few other small but useful tweaks we’ve made to the form builder that will help you to stay organized and save time. That’s all for this time! Ready to give WPForms a try so you can recover those lost leads with offline mode? Get started with WPForms today! Remember to subscribe to our email newsletter and follow us on Twitter and Facebook to be the first to know about new updates and addons. Do you have it planned to implement a “Save for Later” option so people can get a unique link which can then retrieve all their details another time so they can continue where they left off? Since you have storing of abandoned forms and now this offline support, the entries are clearly stored, so it doesn’t seem like a big jump to implement that feature? I agree this would be a great addition. The steps to accomplish this would be quite a bit different from a development perspective, but this is certainly on our request list to consider adding. I’ll add your request to that as well. +1 I agree, a “Save for Later” option would be really useful. If I need to update the program to take advantage of this improvements, it would be helpful to know that and be provided with a link to do it while I am thinking about it. I apologize, but WordPress updates require access to your specific site so we aren’t able to provide a link for this. In case it helps, WPBeginner has a great tutorial on updating plugins with lots more details. Yes, you can absolutely collect multiple entries in Offline Mode. This will work in exactly the same way — when you reconnect to the internet, you’d just need to go through and submit those entries (for more details, please see our tutorial). Offline Mode data is placed in local browser storage and so isn’t generally manually retrieved, though fortunately we haven’t seen any issues with this.